Rally your amigos, let's tell a story! Enter the post-western world of Ruben Carlos Ruiz, a mold-broken loner in over his head and wholly unafraid. Tell an action-packed, full-throttle road adventure story centering on Ruben’s exploits. Add a new chapter to Ruben’s legend as he mavericks his way out of tight situations with bare wits, stunt driver bravado, and judicious application of violence; after all, he is Trouble For Hire. 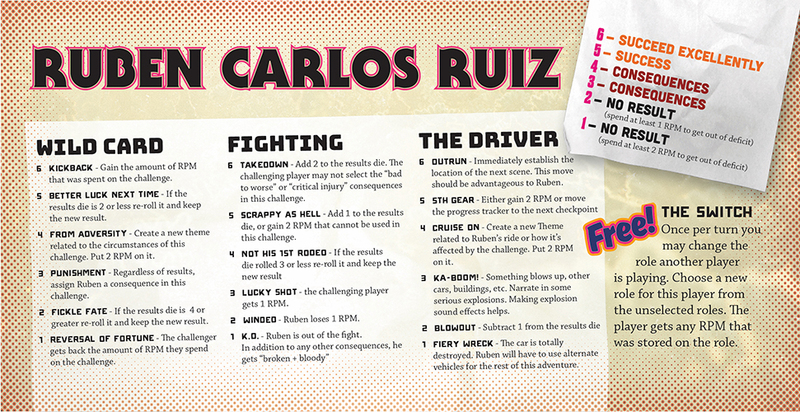 Ruben fights, drives, and mavericks his way through the story. Inspired by 70s road movies and contemporary post-westerns, Trouble For Hire is a tabletop game that casts players in the various roles involved in telling an exciting action story together. Someone plays Ruben Carlos Ruiz, the central protagonist, of course; but the other players take on roles like The Road Through The World that contains and threatens him, his trusty sidekick La Campañero, or the mystical strangeness of the inexplicable La Extraño. Guided by one of the several included adventures, you work together to spin a fabulous, original tale of high-octane cinematic road adventure! 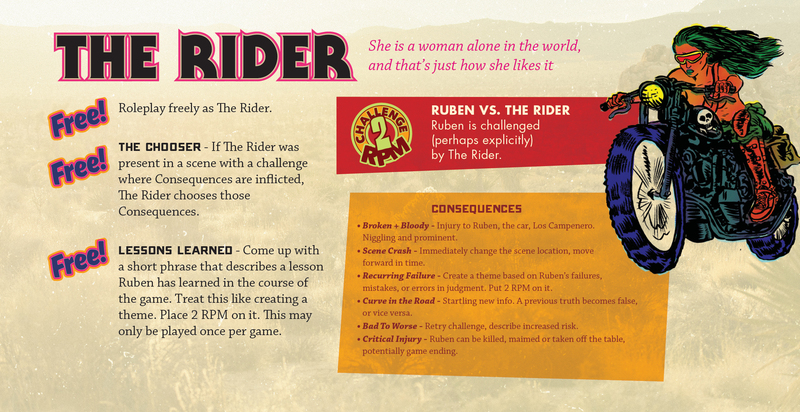 The Rider appears in order to challenge Ruben, whether for his own good or in service to her own agenda! 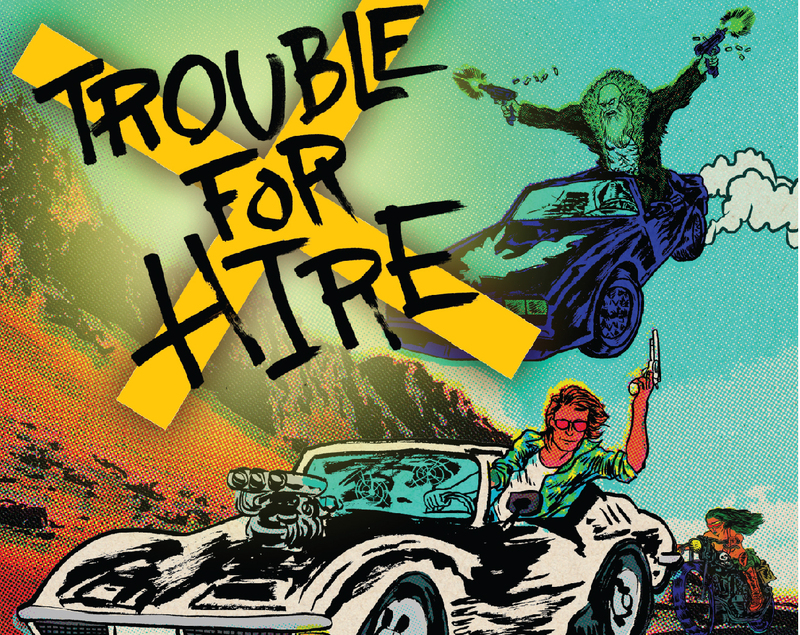 Trouble For Hire is the new storytelling adventure game from Kevin Allen Jr, designer of the Diana Jones Award nominee Sweet Agatha, among other games. It is published by ndpdesign. Includes 8 Roles for play, 6 ready-to-play Adventures, and 20 ready-to-use characters to drop into any story as Ruben’s allies and enemies! Runs on a fast-moving, easy-to-learn rules engine for collaborative storytelling! Doesn’t care if you play a single game, or chain games together into a serial drama! Give you guidelines for hacking and creating your own Roles, Adventures and other elements to make your games of Trouble For Hire unique! Is stuffed full of more juicy inspirational material to get you on the road to adventure than you can shake a stick at! Uses 2d6 and tokens (~30-40) to track RPM, the fuel of play. High replayability - roles can change during the game, and the same adventure can be played multiple times with different sets of roles. Easy to learn and suited to enabling players with different levels of familiarity with tabletop games to play together. Now go hit the road!